One person … one book ………… can change the world. 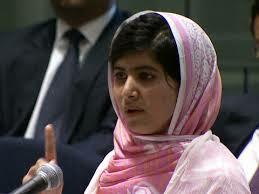 Malala’s speech is breathtaking … she is 16 yrs. old … speaking in a foreign language … what profundity! During her speech, cameramen allowed us to see men and women brushing tears away. We can all learn from this beautiful young lady! She sees a world to love and educate … can we do likewise?